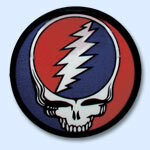 3" round Grateful Dead SYF magnet. Put it on the fridge or filing cabinet. Officially licensed Grateful Dead merchandise.